OSR News and Reviews: Mythic Fantasy Review — Xena for Labyrinth Lord (Advanced)? Mythic Fantasy Review — Xena for Labyrinth Lord (Advanced)? Even before I started playing D&D in '78, I was very interested in mythology thanks to the D’Aulaires Book of Greek Myths. While D&D had some Greek monsters and such, it was primarily more based on Tolkien and more Northern European fantasy. 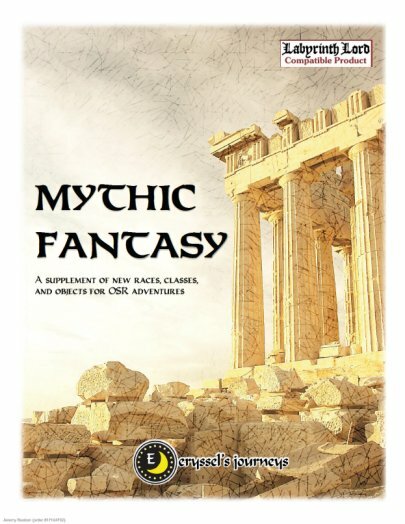 Mythic Fantasy is a short rules supplement ($2.99 and 30 pages) for Labyrinth Lord (mostly the Advanced Edition) that provides Greco-Roman rules for characters and such. Somewhat ironically, written by someone with a Tolkien-esque nom de plume, Thredith Undomiel. Three new races are introduced, the centaur, the satyr, and the nymph, though the latter has five subraces. 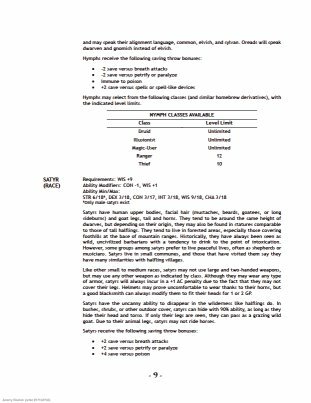 These are not presented in race as class for as in regular Labyrinth Lord, but as 1e style races with ability modifiers and limits, special abilities, eligible classes, and level limits. They seem fairly solid as races, with centaurs having the most additional rules to account for their horse body. Nymphs seem perhaps too good, they don't seem to have any penalties, just bonuses, with high level limits as well. The classes are more of a jumble: You have the Amazon which is definitely Greek, as is the Hoplite. But then there is the Gladiator, definitely more Roman (or possibly Thracian), the Bounty Hunter (which doesn't seem Greek or Roman), and lastly the Chronicler. The bounty hunter is also basically just a fighter, but they can move silently and hide in shadows like a thief. However, instead of using these to setup the backstab ability, he uses them to put them in a headlock and choke them unconscious! This has a fixed 33% chance (1-2 on a d6) to render them unconscious. Personally I think a chance that improves with level would make more sense. The chronicler seems to be something of a sage like character, with some knowledge based skills and limited spell casting. Basically they don't get lost, can figure out the stats for non-magical animals, and have four levels of spells. 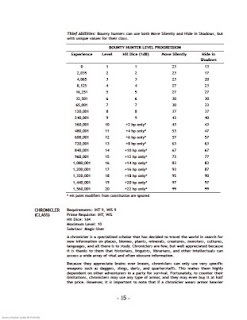 However, their spell levels are not equivalent to MU or Clerical spell levels, 8th level magic-user spells like Clone and Power Word Blind are 4th level Chronicler spells. MUs gain the ability to cast 8th level spells at around 15th level; here Chroniclers can cast 4th level spells at 8th level. The selection of spells is extremely limited, though, only 18 in total across the 4 spell levels). 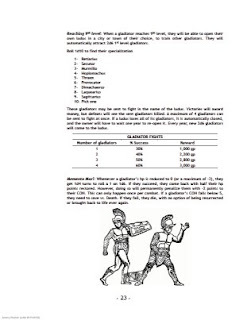 Hoplites are fighters specializing in using spears and similar weapons and fighting defensively with a shield. They gain additional bonuses for defending and can stab (or skewer, I guess) two opponents with one attack, if the second target is behind the first. Gladiators are yet another fighter class, which is hardly surprising. They gain a bonus to their fighting depending on which style they were trained in, of which there are 9, which most people are probably familiar with. Some of these seem a bit overpowered, but those tend to be severely hampered by the lack of full armor. For instance, the Dimachaerus fights with two daggers or swords and does much damage with them, but can only wear a helmet. The Secutor on the other hand, can wear armor up to banded, but doesn't have anything special, save strangely +2 bonus to save vs paralyzation or petrification. Lastly, is a section on new items, most weapons. There is a tendency for new weapons introduced to be more powerful than existing weapons, because I guess some exotic factor. That is definitely the case here. Here you have Xena's favorite weapon, the chakram (basically a metal, sharp frisbee) doing 1d8 damage. You have a type of bow that does 1d10 damage. Also from Xena are the "chobos", which are basically just escrima sticks. They do 1d6 each, which frankly is way too much (I actually studied a form of escrima, kali, for a year) but basically what AD&D's "Jo Sticks" do. It's a somewhat spartan looking PDF (pun intended), single column, little art, somewhat mimicking the look of the Labyrinth Lord books. While I don't usually point out problems with the OGL, this makes one mistake you should never, ever do, put products that are not OGL products in Section 15, even if it's just inspired (in this case, the Xena RPG from WEG). Section 15 is specifically for products you used open content from, period. Nothing more, nothing less. It is not a credits section. Mythic Fantasy is okay, but I'm not sure how much I'd use in my game (and I use a lot of classes/races). I think it's also perhaps too focused towards fighter-like classes, without doing all that much to separate them from fighters (other than simply making them better than fighters). If I remember correctly, also from Xena you had something of a bard, a fat con man, and a thief.